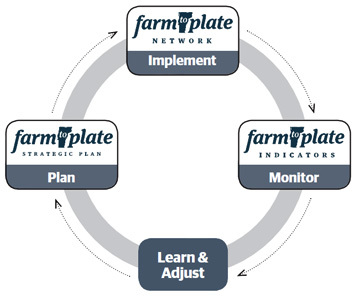 Reporting live from the third annual Vermont Farm to Plate (F2P) Network convening, I am relishing this opportunity to work with and watch a successful network move into its third year of existence. There is much more to share about the F2P journey, which I hope to do in a follow-up post to this one, but for now, I wanted to highlight a couple of themes that continue to resonate throughout the convening and contribute to the growth and success of this network. Show up, keep showing up. The Steering Committee does not run the network. People who are closest to the ground animate this structure. And they are showing up in greater numbers each year as space continues to be made, invitations continue to be offered, and value demonstrated. Lead with generosity. This has been a refrain from the very first convening. As Ellen Kahler of Vermont Sustainable Jobs Fund has stated a number of times, the more you give the more you get and the richer this network will be. The richness is evident in the fact that the vast number of those surveyed say they are benefitting from engaging with colleagues in different parts of the network. Stay humble and grounded. One of my favorite lines from last year’s convening, came from Secretary of Agriculture Chuck Ross who definitely leads by example – “Don’t get caught up with being uber goobers.” The idea is that people need to roll up their sleeves and contribute, add value. One of my favorite network principles – contribution comes before credential.